Dualchas Architects have marked their 21st anniversary with a practice re-brand that has seen it adopt the image of a wild Hebridean goat, a symbol of resistance dating back to the Highland clearances, as a new identity, report urban realm. 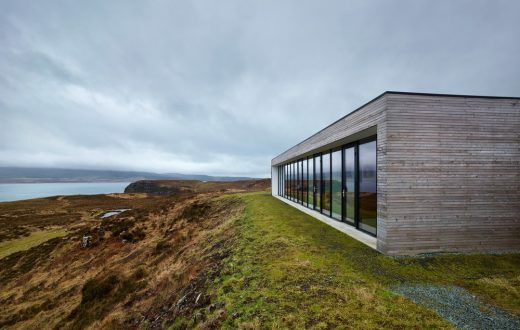 Formed in 1996 by Neil Stephen and Alasdair Stephen on Skye this architecture practice has built a reputation for contemporary residential architecture throughout the Highlands and Islands. Their simple contextual designs reinterpret historic styles such as turf-topped blackhouses. Co-founder Neil Stephen commented: “Our manifesto comes from the idea of what architecture can do for cultural confidence and helping Highland architecture be important. When you look at what Dualchas does in contrast to other practices, it has been clear we have led the way in establishing that. The charging goat motif symbolizes the replacement if people with sheep throughout the region, a process which saw domesticated goats left behind – with survivors subsequently running feral in remote glens. The practice website appears to be under reconstruction so we cannot provide a link to further news at this time. 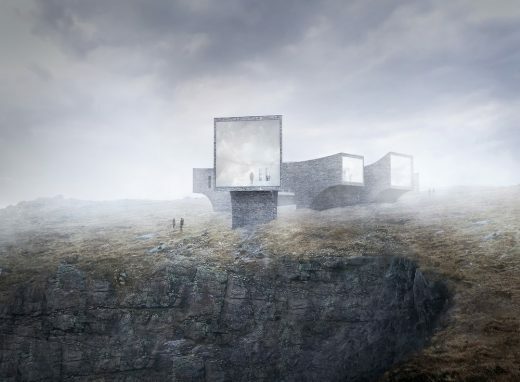 Reiulf Ramstad Arkitekter and Dualchas Architects have revealed their vision for the St Kilda visitor centre. 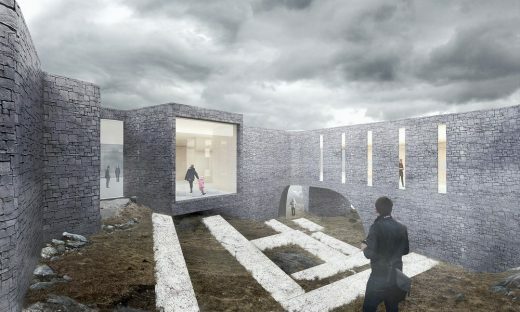 Located at a site called Geodha Sgoilt, a clifftop site in the Uig area of the island of Lewis in the Outer Hebrides, the proposal aims to allow visitors to experience some of the drama and exposure of St Kilda without visiting the famously remote archipelago. According to Reiulf Ramstad, design director and founder of RRA, the project is inspired not just by St Kilda, but by the distinctive landscape and environment of Geodha Sgoilt. The isolated Atlantic archipelago, also known as Hiort, lies over 50 miles to the south west of Uig, and is a triple world heritage site, famous not just for its dramatic sea cliffs and marine life, but the story of how a community survived in a remote location prior to being evacuated in 1930. Together Reiulf Ramstad Arkitekter and Dualchas Architects won the architectural masterplan competition earlier in the year. The project is first in the UK for the world-renowned Oslo practice. The client, Ionaid Hiort, is a community company based in the small Lewis community of Uig, comprising fewer than 400 people, with the projected supported by Highlands and Islands Enterprise and Comhairle nan Eilean Siar. The inspiration behind this project is the idea that the story of a abandoned community could help an existing fragile community survive. By building a world-class facility that is both a visitor attraction and research centre, the community hope to reverse the population decline they have been suffering, and use the centre as a catalyst for economic development in the Western Isles. The architects have been working closely with the exhibition designers Metaphor on developing the design that can tell the extraordinary story of St Kilda. For Ionaid Hiort chairman Iain Buchanan, the story is one that will resonate with peripheral communities across the world, and one that can be an inspiration. The project has the backing of UNESCO, who are looking at the project as template for creating “remote access” to the many World Heritage Sites that are out of reach for reasons of geography, environmental fragility or even being located in warzones. UNESCO World Heritage adviser, James Rebanks was originally commissioned to write a feasibility study on the project. 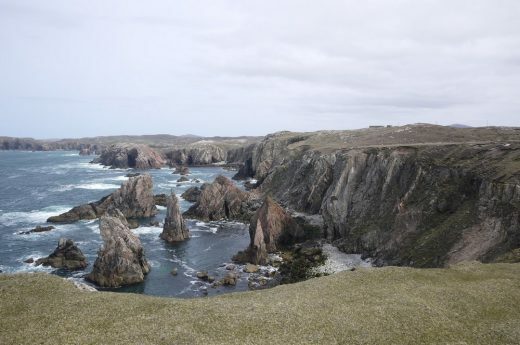 In Rebanks opinion it should be “something world-class that can be a game-changer for the Outer Hebrides” and described the concept as “a world-class idea” capable of “providing a global best practice example of remote access story-telling”. The hall is rendered civic through this heightened awareness of scale and through minimal detailing. Externally all detail is removed – no rainwater goods. A single material, a larch rainscreen, is courageously used to envelope both wall and roof.